Ella Pamfilova (in the middle) became CEC head in March 2016. 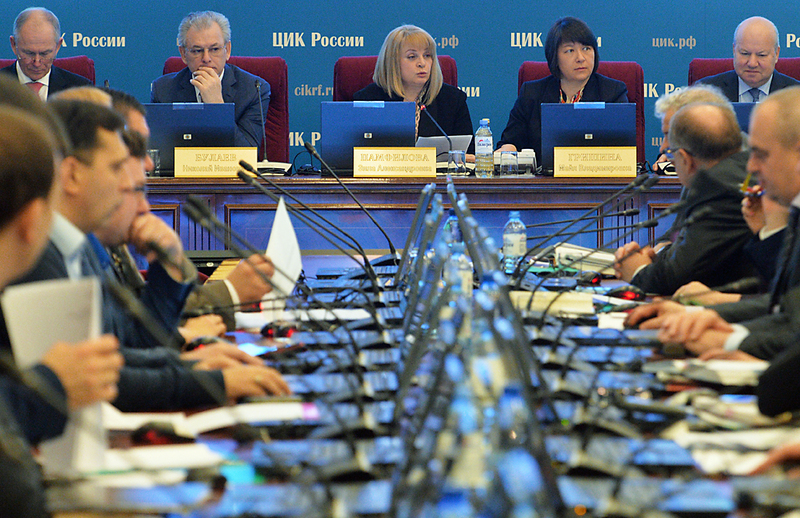 A total of 117 observers from various international organizations have received accreditation from the Russian Central Election Commission for upcoming elections to the State Duma (lower house of parliament), the commission has reported on its website. These are observers from the CIS Inter-Parliamentary Assembly (36), the OSCE Office for Democratic Institutions and Human Rights (ODIHR) (76), representatives of the CIS monitoring mission (4) and one observer from the CSTO Parliamentary Assembly. Earlier reports said that the ODIHR is planning to send 500 observers to Russia, including 80 long-term and 420 short-term who will arrive just before the elections. The first groups of observers have already come to Russia and began working. The mission is led by former Norwegian Foreign Minister Jan Petersen. On Aug. 16, Ella Pamfilova, the head of Russia’s Central Election Commission, held a meeting with the head of the international CIS monitoring mission, Vladimir Garkun. According to Garkun, the mission will include about 200 observers. Elections to the 450-seat Russian State Duma will be held on Sept. 18 under a mixed system: 225 lawmakers will be elected in one-seat constituencies and another 225 will be elected by party tickets. On June 17, Russian President Vladimir Putin signed a decree setting the elections, which was published on the same day the election campaign officially got underway. In addition to the State Duma elections, 39 regions will elect their legislative assemblies, while seven constituent regions will hold direct elections of their top officials. Concurrently, municipal elections will be held in about 5,000 constituencies. What is the Kremlin doing to make the parliamentary elections honest?